A crispy autumn hike inspired this 5x7 inch oil painting. There is nothing like a sunny day in October to get a person out of the house and breathing deep. Fresh air and the smell of pine are reminders that the clouds and rain are not forever. The painting can be purchased at Small Impressions Paintings on Etsy. Visit this link to view it in the shop or make a purchase. 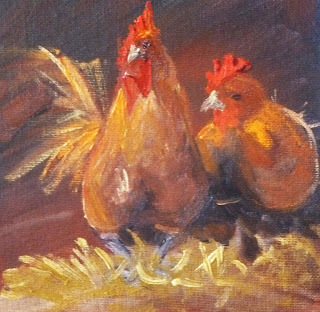 Often, when a painting isn't turning out the way I like, I'll wipe it off the canvas and set the canvas aside. The wipe off leaves color, but not any discernible image. When it dries, into a bin it goes. I have a box of canvases that have the residue of an unsuccessful paintings. The funny thing is, days later, when the canvas is dry, that left over color provides me with some crazy, abstract inspiration. 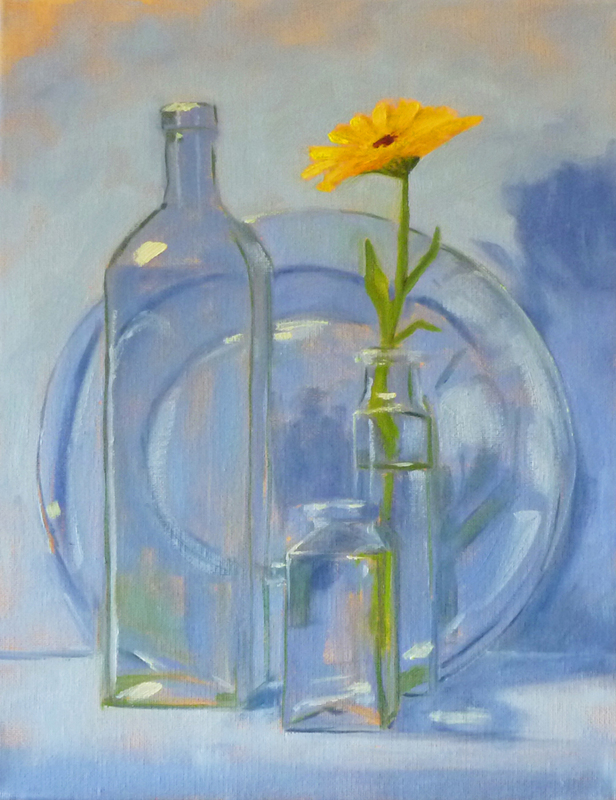 This little 6x6 inch painting is the result of some of that kind of inspiration. I can't remember what was originally painted on the canvas, but the wipe out left a beautiful dark red, a wonderful color for the deep recesses of a happy little chicken coop and a pair of roosting fowl. I am happy with the resurrection and have placed the painting for sale in my Etsy Shop, Small Impressions Paintings. It can be viewed in the shop or purchased at this link. Finally, my house is in order after several weeks of chaos. The carpets are new, the studio is organized, and I spent the morning enjoying peace, quiet, and paint. 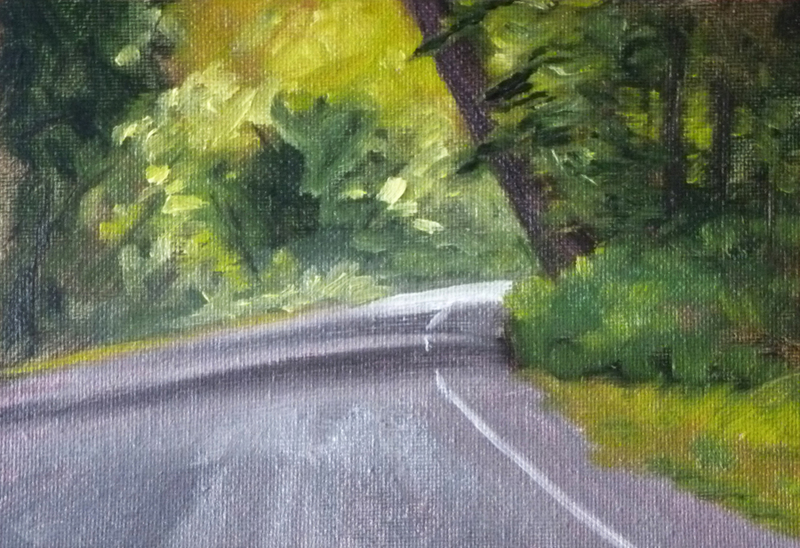 The result is today's little 5x7 inch oil painting that was inspired by one of my favorite bicycle rides. In Point Defiance Park at the North End of Tacoma in Pierce County, Washington is where one will find this magnificent ride. The road through the park is one way and the speed limit for automobiles is 25 miles an hour. The foliage is beautiful and old growth trees line the scenic path. Puget Sound viewpoints are sprinkled along the way and rolling hills create a wonderful challenge. This little painting is based on the first part of the trip through the park's Five-mile Drive. When traveled by car, it seems like a slight incline, but on a bicycle, it feels a lot longer and steeper. Some of the friends I ride with call it "The Monster," but I've grown to love this fun little challenge. Slipping into the low gear, keeping a steady pace, and looking for landmarks that signal progress has made this pathway one I love. The tree in this painting is one of my beloved landmarks. It signals the halfway point on the trek up the hill. Visit my Etsy Shop, Small Impressions Paintings and where it can be purchased or viewed in the shop. Click this link to view it. It has been a week since I have been able to set foot in my studio. I'm getting the no-paint blues. We are putting new carpet in the house which has caused considerable upheaval. The living room is finished, but my entire studio is stacked in the front room. Paintings are piled everywhere. In spite of a lack of room for painting, I haven't stopped the movement of paintings into my Etsy Shop, Small Impressions Paintings. 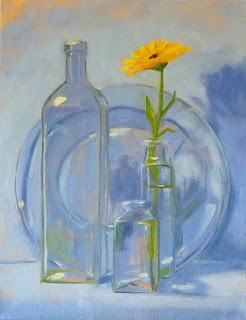 This painting is 11x14 inches, was completed in oil, and can be viewed or purchased by clicking here. I'm hoping this blue painting will help cure my no-paint blues and get that darned carpet installed a little faster. 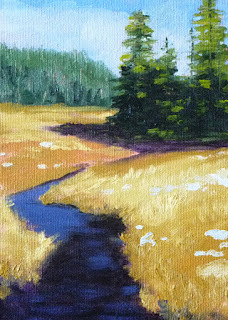 From a photo, this little 5x7 abstract landscape painting emerged. It was fun to create the light and reflection from an evening in Paris. 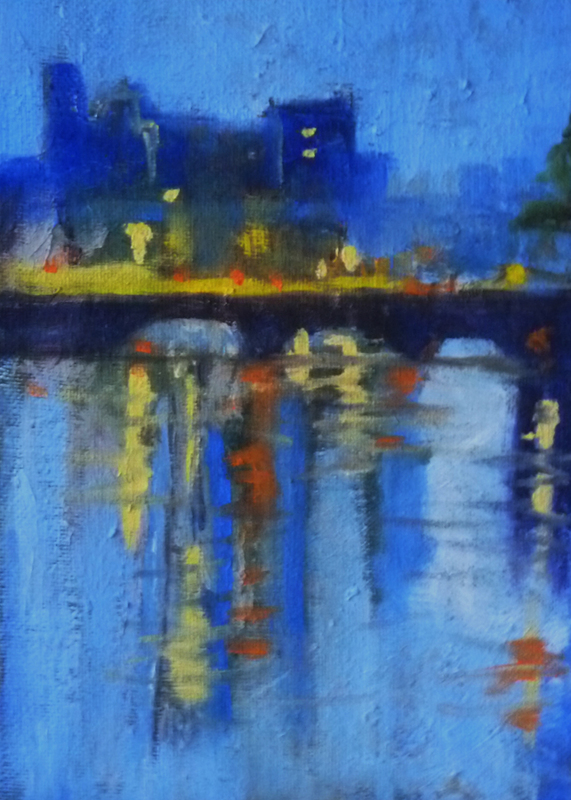 The painting is for sale at my Etsy Shop, Small Impressions Paintings. Click here to view it in the shop or make a purchase. If you'd like to see all of the paintings in my shop, visit this link. Today's landscape was inspired by the beautiful meadows of Yellowstone National Park. It has been a few years since I visited, but the memories are strong. 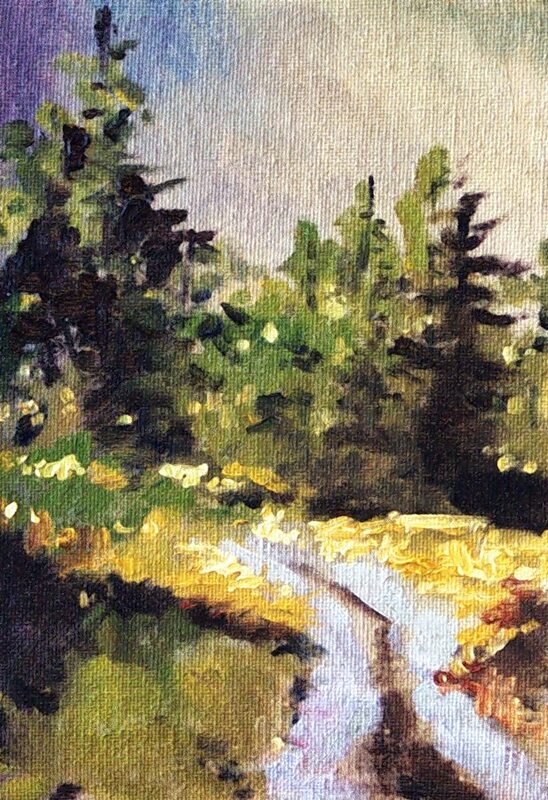 Though this 5x7 inch painting is SOLD, other small landscape paintings can be purchased at my Etsy Shop, Small Impressions Paintings. Wherever you live in the Pacific Northwest it seems one can view a mountain. This one is Mount Rainier viewed across Puget Sound in the late evening at sunset. It has set me onto a series of little mountain paintings. 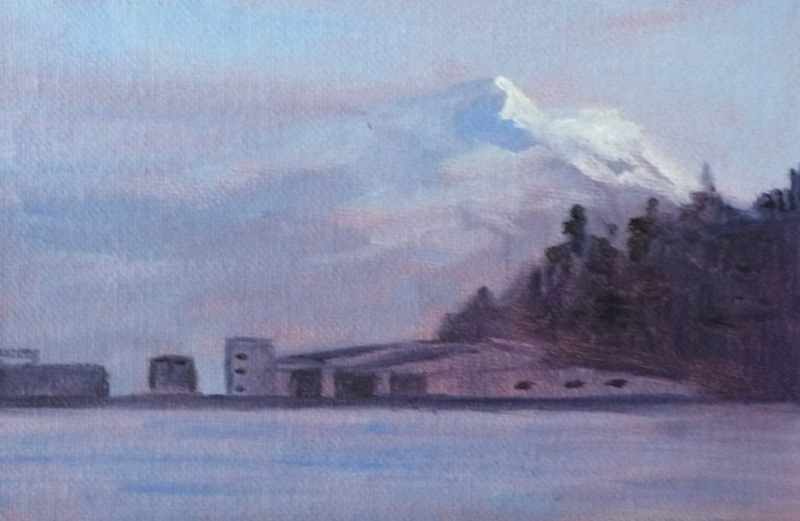 There's something really fun about painting a giant mountain onto tiny little canvases. This one is 4x6 inches and can be purchased at my Etsy Shop, Small Impressions Paintings, by clicking here. Fall has arrived. Pedaling my bicycle is risky business these days. I'm never sure whether the rain will show up before I get to my destination. 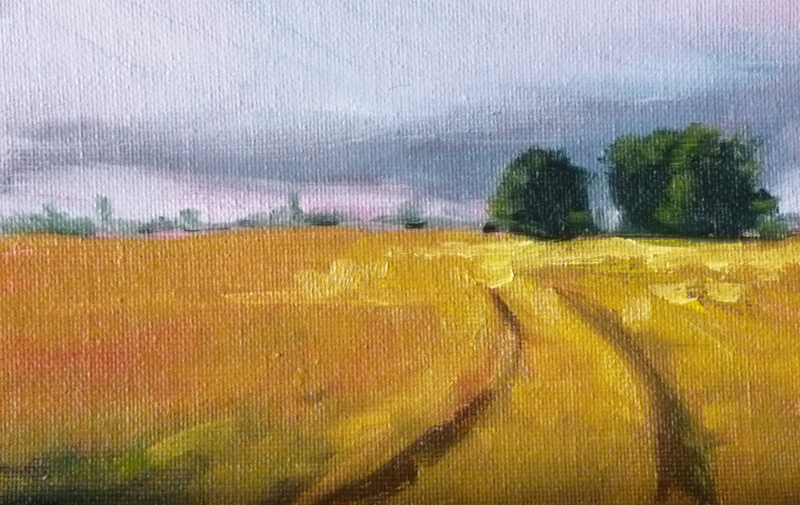 The sky threatens all the time and inspired this 4x6 inch oil painting that is now for sale in my Etsy Shop with some of my other landscape paintings. Visit this link to view it in the shop or make a purchase.